Mack’s korvatulpat on valmistettu silikonista ja ne muovautuvat jokaisen yksilöllisiin korvakäytävän muotoihin ja ovat siten äärimmäisen mukavat käyttää. Pakkauksen mukana tulee pirstoutumaton kantokotelo. The earplugs may be re-used until they are dirty or no longer sticky (up to 5 uses). Keeping your hands and ears clean and dry prior to handling/applying the earplugs will help prolong the useable life of the earplugs. First try re-reading the directions, then apply a fresh pair of earplugs, making sure your hands and ears are clean and dry. 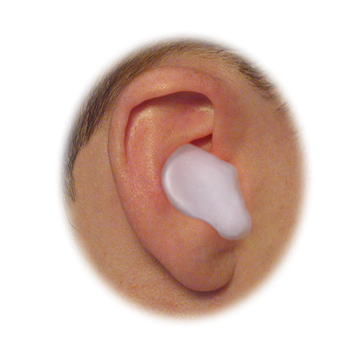 Moldable silicone earplugs are designed to stick to the surface of a clean, dry ear. If the earplugs are being used in a moist and/or dirty environment, be sure the hands and ears are clean and dry before applying or re-inserting the earplugs or a proper seal may not be achieved. A sign that you have achieved a proper seal is that your own voice will sound more internal and exaggerated. Lastly, try covering the ear canal with the earplug starting from the rear and moving toward the face. This technique squeezes out some of the air in the ear canal before sealing it shut, thus creating a bit of a suction effect. This last technique takes a little practice but creates an excellent seal when done correctly. No. The earplugs are designed to cover the ear canal. Breaking them into smaller pieces may cause the user to push the earplug into the ear canal making it more difficult to remove. We recommend using Mack's® Kid's Size Silicone Earplugs for children six and under. These earplugs have been used while flying since the early 1960's and our users report them to be safe and effective for reducing flying discomfort. 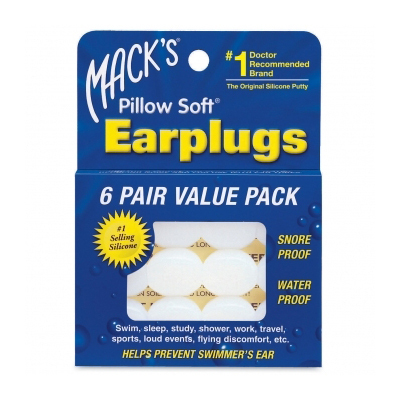 In addition, Dr. Ira Rubin, MD, PhD has found Mack's® Pillow Soft® Silicone earplugs to be an effective tool in preventing ear pain in children, especially infants, during plane trips. 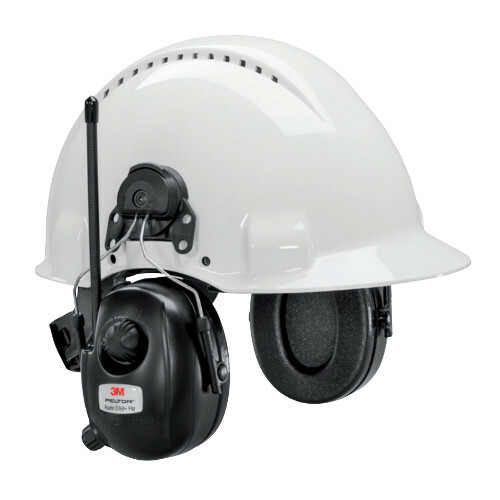 As he is quoted in a leading pediatric journal: "When molded to the ear canal, they protect the ear from painful air pressure changes and reduce noise as well. Parents report that ear plugs work especially well with infants when left in place for the entire flight. I suggest a trial run a week before the trip if parents anticipate a child's refusing to leave the ear plugs in place." As the earplugs are only to be used as an aid, the user needs to take an active roll in trying to prevent the onset of the discomfort. The person should try to stay ahead of and prevent the discomfort by trying to "clear" their ears by one of the various known methods. This is especially important during descent when most of the discomfort occurs. One of the methods involves plugging the nose while applying slight blowing pressure while holding one's breath. Another method is to chew gum. It is not the gum itself, but the wide opening motion of the jaw and the act of swallowing that helps aid in the equalization process. Therefore, either faking it or merely munching on some snacks can achieve the same results.